There is something about dinosaurs that mesmerizes little kids. I think almost every home has a child that went through an intense dinosaur obsession – fascination or phase where they eat, sleep and breathe nothing but these prehistoric beasts. In truth, they’re massive, scary, strong and some of them are dangerous predators that would eat you in a heartbeat. But, kids see these extinct creatures a lot differently. Visually experiencing the magnitude of their size is captivating and hypnotizing and kids just want to learn more about them. Books are a great way to introduce children to unlimited fields. They’re also great teachers and can help kids delve into subjects they resonate with, like dinosaurs. Here are some great dinosaur books that preschoolers will find compelling. 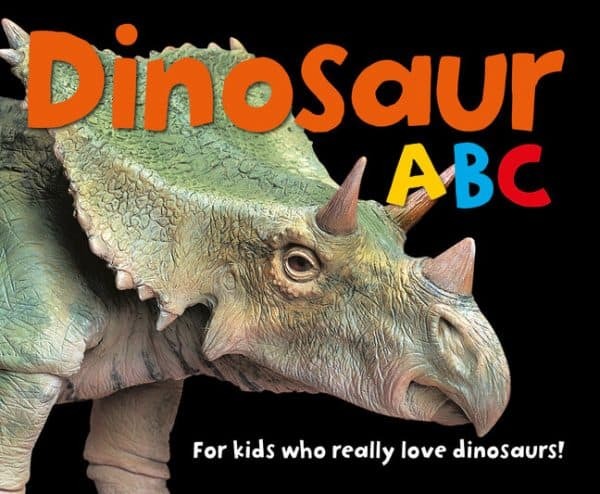 Dinosaur ABC is a colorful, high gloss board book that literally shares different dinosaurs that cover every letter of the alphabet. My family and I were amazed because we had no idea there were so many varieties of dinosaurs. Many of them we’ve never heard of before, such as the Kentrosaurus and Ultrasauros, so it was very educational even for older kids and adults. Children will enjoy meeting 26 dinosaurs and prehistoric beasts from Allosaurus to Zephyrosaurus. Each alphabet letter will share a lifelike image of the dinosaur, a brief description that a child can grasp and a pronunciation guide that will help them sound out the names. They also show the size of the dinosaur compared to an adult man. This is a great book for that dinosaur enthusiast. Recommended for ages 2 – 5. 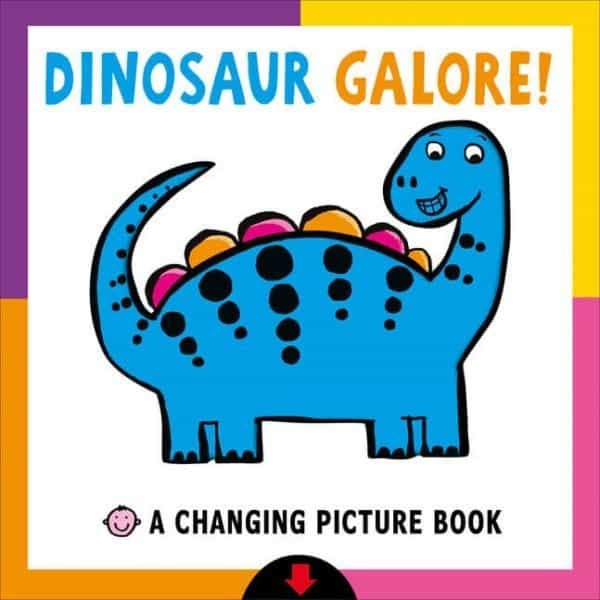 Dinosaur Galore is a picture changing book that teaches preschoolers all about opposites using cute brightly colored cartoon dinosaurs. Kids will be enamored with the different transformations each dinosaur makes through clear plastic windows and the arrow pull tab at the bottom of every page. When they pull the tab, they’ll see a dinosaur change from friendly to scary, to different colors, from soft to scaly and from spots to stripes. Each page also asks a question for children to ponder, like ‘If you could choose a dinosaur, would it be friendly or scary?’ They can view the friendly dinosaur and then pull the tab to see the scary dinosaur. This step helps improve eye-hand coordination and encourages children to make personal choice decisions. Recommended for ages 0 – 3 years. 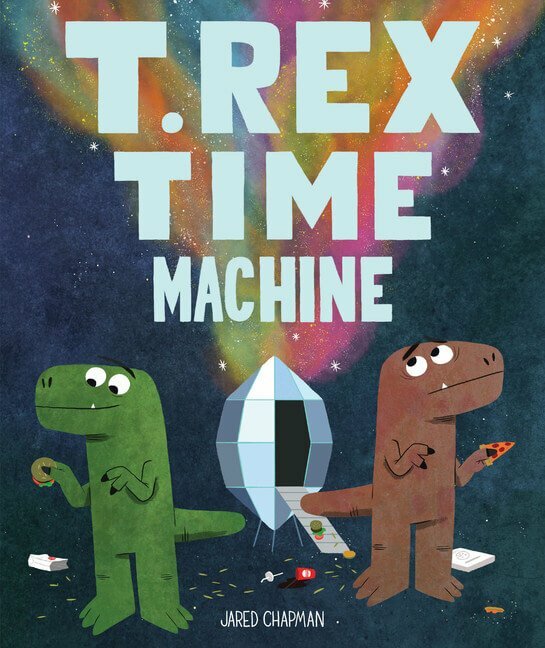 T.Rex Time Machine is about two hungry dinosaurs that hop into a time machine that takes them to the year 2018. I bet you’re wondering how this could happen. Well, an astronaut traveled back in time to the prehistoric age and landed close to these dinosaurs. When the space traveler came out of his spaceship, the dinosaurs wanted to eat him and he ran away. So, of course, curiosity and an open door tempted the dinosaurs to enter the egg-shaped ship. Next thing you know, they are traveling from their prehistoric world to a world of fast foods and modern technology. Everywhere they looked they found different foods, pizza, tacos, burgers, cakes, subs, and donuts. They were very happy that they didn’t have to go far to get food. They were also captivated by the sun box (microwave). But, they’re sheer size and outrageous appetite attracted the attention of the police. Scared, they wanted to go back home where they felt comfortable. Did they make it? This is a super cute book with a captivating story. The only thing that is left unanswered is what happened to the astronaut. The kids were upset that he didn’t get to go back home. I want to win this for my 5 year old grandson. He has loved dinosaurs since he was able to know what they are. Thanks for the chance to win. love to win for my Dinosaur loving grandkids, would be fun to read the books to them! My niece would like these books. I want to win this prize so my Granddaughter and I can explore Dinosaurs together. I would like to win these for my cousins son who loves Dinosaurs. My grandson would love these, he loves his dinos!! My nephew loves books and reading together! I’d love to win this for my grandson in Germany he’d be thrilled, thanks for the chance to win it. My boys are big fans of dinosaur books. I want to win this for my son and daughter. They love to go outside and rockhound and have even been with me to discover fish fossils. They love dinosaurs. These books would be great for my grandson who loves dinosaurs. I would love this for my daughter and son. My daughter loves learning about dinosaurs. Thanks! My granddaughter loves dinosaurs and enjoys reading about them. My granddaughter is having her 4th birthday this month and is simply in love with dinosaurs! anything and everything dinosaurs she has to have! this prize would make her ‘tickled pink” to win it! Thanks! My great nephews would love this prize. My niece’s August tradition is take them to Drumheller every August where they love the museum and exploring the badlands. My daughter manages a Day Care and the kids are just crazy about dinosaurs. I would gift them the prize. I would like to win this for my grandkids , they would really enjoy them. I want to win this for my son. It’ll fit perfectly with the dinosaur theme nursery,. These would be for the young children of the lovely woman who takes care of our condo building. My granddaughters would enjoy these books about dinosaurs. I’d love to win this for my friend’s Son. He loves all things dinosaurs and would likely learn a lot from these books! Would love to win because my 3 year old daughter LOVES dinosaurs! Love to win this to gift to a little guy I know who wants to be a paleontologist! I would love to give this to my sons! My 2 and 4 year old are big fans of dinosaurs. Thanks for this generous chance! I would love to win this as I have 2 young nephews that are right at the dinosaur loving age! I would love to win this prize for my godson/nephew; he LOVES dinosaurs and he also loves reading and books. This would excite him to no end! My eldest Granddaughter LOVES dinosaurs! These books would be great for my son who loves dinosaurs. I would love to win this for my 2 dinosaur loving kiddos. They are obsessed with all things dinosaurs. My niece loves anything with dinosaurs….I would love to win for her because she’d be excited to get these. I want it for my 12th year of toys for tots. My son loves dinosaurs. He would love to get this. I’d like to win this prize because I have a very curious 5 year old granddaughter who is fascinated with all sorts of animals. I want to win these books because I some some grandsons who are totally into everything about dinosaurs. My son is crazy for dinosaurs! A kid in our daycare loves dinosaurs! I want to gift these books to my niece and nephew. They love dinosaurs and books. Who wouldn’t love to read a book and look at the pages of these fascinating creatures. Dinosaurs are one of many toys my youngest Grand son loves, he would love this prize most of all. Our boys love dinosaurs. We haven’t read any of these books but would love to check them out. The youngest would read the opposite book over and over. While the oldest would laugh out loud with the time travelling, taco eating dinosaurs. I would like to win these terrific books for my grandson, he loves dinosaurs and is an avid reader. I would love to win this because my 6 yr old grandson loves dinosaurs and knows so much about them. My grandson is obsessed with dinosaurs right now, he would love these. My son loveees dinosaurs he would go nuts over this!!! I would love to win this because I Nanny a little boy who loves Dinosaurs. My Son love Dinosaurs. These would be great for bedtime.